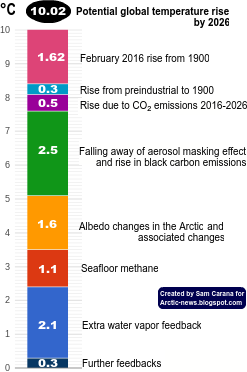 For years, warnings have been raised about the dramatic decline of Arctic sea ice. 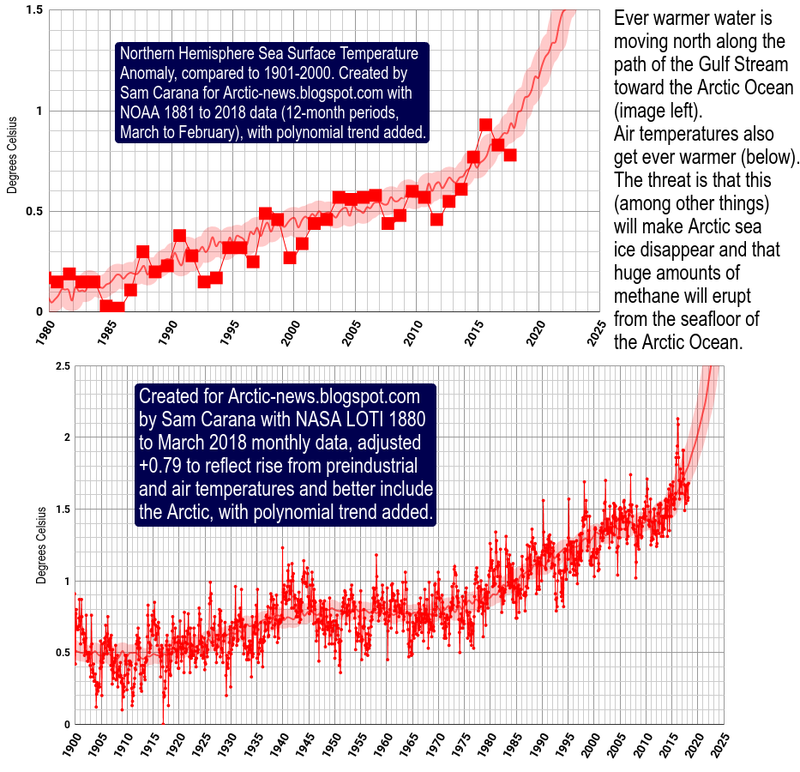 Various posts at this blog have also analyzed the exponential nature of the decline in summer sea ice volume and the many feedbacks that fuel this decline. And for years, the conclusion has been that - without action - the sea ice looks set to disappear altogether within years. Yet, many are still ignoring this warning, often with remarks such as "some of the ice is 5 meters thick; it would take decades for all that ice to melt!" Thick ice does indeed pile up along the northern coast of Greenland and Ellesmere Island, due to the way the ice drifts. This has lead some to argue that an S-shaped curve (sigmoid or gompertz trendline) was more appropriate, with the decline in sea ice volume slowing down as it approaches zero. However, this argument doesn't seem make much sense, since such a S-shaped trendline would only apply to a relatively small area with very thick sea ice. Exponential curves would still remain the best fit to predict the decline of the sea ice in the Arctic Ocean at large. Moreover, is it really more appropriate to say that summer sea ice looks set to virtually disappear within years, with just a tiny sliver of ice remaining north of Greenland and Ellesmere Island, instead of saying that the sea ice looks set to disappear altogether within years? How persistent will such a sliver really be? One of the feedbacks of sea ice decline is that, as the decline progresses, cyclones can be expected to hit the remaining sea ice ever harder. How much damage can such cyclones and further feedbacks do? A previous post describes thin spots developing in the sea ice under the influence of a cyclone. The image below shows areas at the center of the Arctic Ocean (large circle) where thickness of the sea ice fell from 2 meters to 1 meters over a period of 21 days. Furthermore, the image below also shows that, over this period, 5m-thick ice was reduced to 3-meters thickness (top small circle), while 2m-thick ice was reduced to zero (bottom small circle). In conclusion, without action the Arctic sea ice looks set to continue to decline exponentially, while strong feedbacks such as cyclones developing when there is more open water, look set to add to the decline and cause the Arctic sea ice to disappear completely within years. For an overview of lines of action, see this post at the methane hydrates blog.